Hey! You are wise to be contemplating K&J as your descaler for keurig coffee maker. - Proprietary blend of natural, food-grade ingredients. - Flushes through 100% (no residue or aftertaste). - Eats aggressively at grime and buildup but is gentle on your machine. - Improves the taste of your next cup by eliminating the metallic "deposit tea" flavor. - Comes with our Double-Heated Foil Shipping Sea so nothing is spilled en route to you. - You get TWO USES PER BOTTLE (and we marked the bottle to show you exactly how much to use and when). - You get your money back if you don't like something about our descaler (and we made it easy). Unlike other brands of kurig descaler solution, our solution is 100% water-soluble and washes through without a trace, leaving behind super-clean internal parts and nothing else. By contrast, vinegar leaves behind the most residue. This is why your next brew tastes so weird after a vinegar cleaning (which is less effective than commercial descalers in the first place). 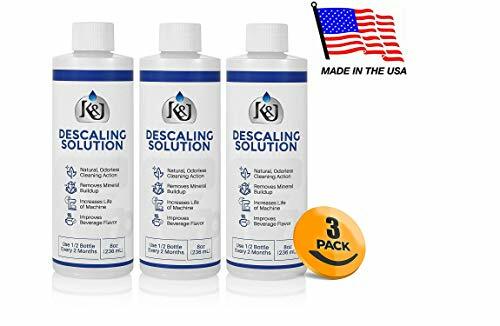 K&J's proprietary keurig cleaner descaler is not only less expensive, but more effective than the leading brand. Compare: You get one cleaning from one full 14oz. bottle of "their" descalers, and TWO complete cleanings from only 8 oz of K&J's descaling solution. AND, if you disagree with the claims made about the solution after using it, then you get 100% of your money back, no questions asked. We are that confident that you will love this newer, safer product. Honestly, it's a no-brainer and we are looking forward to helping you make your machine like new again! Works for all brands of Coffee brewers, including: Keurig, Breville, Cuisinart, Kitchenaid, Nespresso, Delonghi, Tassimo, and more! ► NATURAL, ODORLESS CLEANING ACTION - K&J's proprietary blend of natural, food-grade ingredients has created a descaling solution that is 2x more effective than the leading brand and at least 5x more effective than vinegar! Proudly made in the USA. ► REMOVES MINERAL BUILDUP - Removes white buildup and grime from minerals deposited from water on your heating coils and reservoir tank walls, bringing your coffee brewer from old to new. ► INCREASES LIFE OF MACHINE - This special, natural formulation will not damage your internal parts and will, in fact, extend their lifetime by ensuring that they are working at peak efficiency. Proper maintenance and using the right cleaner is very important for the longevity of your brewer. ► IMPROVES BEVERAGE FLAVOR - When your heating coils are coated with layers of insulating deposits, these deposits must be heated before the water is heated. This produces a slightly metallic flavor that we call "deposit tea". K&J's descaling solution safely removes these deposits, eliminating this metallic flavor with no weird aftertaste. ► SATISFACTION GUARANTEE - Better than the leading brand or your money back! We have made it ultra-easy to get a refund if you don't agree that this is the most effective coffee machine descaler after using it. Just follow the one-step instructions that come with your package.